DO THE LITURGICAL YEAR AND THE EUCHARIST PRESENT HISTORY OR MYSTERY? The Church’s liturgy demonstrates varied symbolism and a wide versatility in the presentation of content and meaning. Some texts reflect history, at times so vividly the events seem current. Sometimes the action reported pertains to the present as it petitions or proclaims grace. Or our gaze is lifted high to the Parousia, to judgment and heaven, oriented toward the future. The liturgical texts seemingly leap from one area of reference to another, sometimes within the same sentence. Frequently it is doubtful which area of concern is intended, or it may be left undecided. How are we to absorb and gainfully employ this lively variation in proper perspective? What does the liturgy expect of us? Is it inviting us to recall salvation history? Is it offering us the grace of the present? Or is it perhaps preparing us for the life to come? When we celebrate liturgy we are doing the work of the People of God. The Fathers of the Church, both East and West, taught us that liturgy is nothing less than the ongoing saving work of our Redeemer, Jesus Christ, still present and operative among us through the Holy Spirit. The great Latin Father, Pope St. Leo the Great, in the fifth century explained it in this way: “What was visible in our Redeemer has passed over into the sacraments.” In other words, what Jesus did historically during his earthly life, he continues to do sacramentally through the liturgical mysteries he celebrates in and with his Church. Remember that “sacraments” in the language of the Fathers refers to the mysteries of the whole, visible ministry of the Church, not just the seven sacraments in the popular, technical sense of the term. This reminds us that Jesus is working in us and through us. In effect, each of us is a sacrament of Christ. From the very beginning it is important that we have a clear understanding of the distinct planes, layers, or dimensions on which the liturgical drama is enacted: history, grace, and eschatology. On the historical plane the liturgy re-presents events of the past so vividly as to make them appear as happening today – some from the Old Testament but most from the life of Christ. As an example, consider the Christmas season. The liturgy dramatically re-enacts Christ’s advent and birth. During four weeks it prepares us for the birth of our Savior. In a spirit of simple, childlike longing we approach the great feast. On Christmas day itself the liturgy leads us to the crib at Bethlehem and shows us the newborn Son of God, and speaks of a “new birth in the flesh.” This historical application concerns not only the birth of Christ, but his whole life, the entire history of salvation, and the lives of the saints. Consequently history is an important constituent of liturgy. Action on the plane of grace pertains directly to us and takes place in the present. The liturgy is operative here when it proclaims and produces God’s life in our souls. The historical plane serves as a framework for the plane of grace. The plane of grace is the pledge of future glory and anticipates the dimension of eschatology. On the plane of grace the Eucharistic Liturgy is paramount. Its prayers and those of the Liturgy of the Hours reveal fully the effects of the Paschal Mystery. While quite clear, much is left to our meditation. The liturgy intimates its wealth to us, clothed in the garments of the history of salvation. Many liturgical texts treat of the end of time, of the Parousia, of the next life, of heaven and hell. It is the consummation of the other two planes or dimensions of liturgical action, the end for which they exist and were providentially planned. Advent offers a striking example of the interplay of these three planes or dimensions. The texts of the liturgy express longing for the first coming of Christ in the flesh in terms of history. Always implied is Christ’s coming in grace, a point frequently made explicit. In the mystery of the Mass the appearance of Christ upon the altar is awaited. The ultimate reference, however, is to his final coming at the end of time. We distinguish a threefold advent, although we do not always determine which one is intended in a particular liturgical reading. Sometimes all three may be possible. Stress may be placed now on one, now on the other, and often those at prayer choose the precise application. It is exactly this lively tension that makes the liturgy dramatic. To understand and differentiate these several areas of orientation is the first requirement for understanding the sacred texts. The second task is to apply this understanding to daily life. How do we accomplish so beneficial a task? From the outset we must be convinced that the liturgy is concerned primarily with the present. The past or future are only symbols or signposts of today’s outpouring of grace. The chief function of the liturgy is to bring us divine life now. However, the present may be disguised in the raiment of the past or the future. preview of Christmas would be a mistake. And this is the misdirection of civic and commercial observances. There is much more to Advent and Christmas. We no longer yearn for Christ’s first coming because it is past. But we can put such desire in the service of grace. Through grace Christ comes to us in a manner symbolized by his first coming. His earthly life and work foreshadowed his work in the Church and in our souls. Every year we should long for and prepare for his coming in grace, using the history and symbols of his first coming, his birth and infancy. Although grace is already within us, grace can come to us again and again in fuller measure. In the Mass the liturgy attains its closest contact with the present. In the Mass not only are the Body and Blood of Christ present, but the Divine High Priest and Lamb of God appears on the altar, fulfilling the symbols of his earthly life. By the Eucharist history becomes present and hope becomes reality. The past and future become actual before our eyes. What we read as past history and what we await as future hope merge into a holy now and a blessed today in the Mass. Essential to the celebration and application of the liturgy is knowing that in the mystery of the Mass we transpose to the present everything relating to past or future. The people of the early Church lived with the expectation of the second coming of Christ constantly in mind. With the passing of centuries interest shifted to the present. Yet many eschatological texts are found in the liturgy. However the liturgy does not suggest we dream away the present and live only in the future. When presenting to us the final times it is admonishing us to strip our hearts of fleeting earthly attachments and to anchor them where true joy is found. Thus the frequent repetition of the Lord’s admonition to be watchful and ready always for his coming. His final coming is anticipated in the Eucharistic mystery enacted before us now. Consequently the Eucharistic liturgy is the focal point to which all phases of the liturgy converge. Again recalling the Advent liturgy, we find in the Mass the symbol of Christ’s first coming taking on reality, his second coming is anticipated, and he comes to us in grace. The human soul becomes the scene of that threefold advent. Jesus appears on the altar, visits us in Holy Communion, and enlightens our darkness through the glory and grace of his presence. Liturgy is no ethereal intangible; it is as absolute as birth and judgment and death. Our desire for the coming of the Newborn into the crib of our hearts is not empty sentiment. Underlying it is the solid truth of the “new birth of the Only-begotten in the flesh” (Vigil of Christmas). The sacramental interpretation of the Eucharist presents a veritable treasury of grace embodying all that is proper to the work of redemption -- commemorative, eschatological, or sacramental portent. Through the liturgy we receive our true treasure, the pearl of divine life. Truly the Church year is a year of grace. Is the liturgical year history or mystery? It’s not a case of either/or, but one of both/and. What do you do – besides shopping – to prepare for Christmas? Anything that is really connected with appreciating the real meaning of Jesus’ birthday? What does Advent mean for you? How can we prepare well for the arrival of Jesus at Christmas? Are you familiar with any practices or customs that help make Christmas truly Christ-centered? Remember that Jesus is the reason for the season. Here are some ideas to consider personally, with your family, and with friends and colleagues. Do something really connected with the meaning of Advent to make Christmas truly Christ-centered. Set priorities. Set aside ten minutes or more daily to read and ponder the inspired Word of God in the daily Mass readings or in other Old Testament and the New Testament stories that present the faith of the great characters, men and women, waiting in expectation for the coming of the promised Redeemer. Consider participating in Holy Mass several times during the week, or daily if possible. Take advantage of the wonderful opportunity to receive in Holy Communion the Jesus who became human like us to redeem us. The penitential season of Advent is also a special time to receive God’s mercy in the Sacrament of Reconciliation. Participate in a parish communal penance celebration. 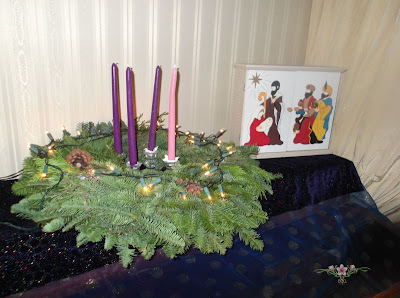 Each evening before the family’s main meal light the appropriate candles on an Advent wreath and offer a brief Advent prayer. This is a time-honored practice. The symbolism of the wreath and candles presents an occasion for learning the meaning of this season. The color of the purple candles signifies the sorrow we feel for our sins, while the pink one indicates happiness for the imminent birth of Jesus. The evergreens symbolize the unchanging nature of God, and the circle indicates that God is eternal, without beginning or end. The light of the candles reminds us that Jesus is the light of the world. The spirit of caring and giving for another member of a family or group is another revered Advent custom. Each family member draws the name of another family member written on a slip of paper, for whom he or she will secretly play the role of Kris Kringle (Santa Claus), or Christkindl (the Christ Child). The person whose name was drawn is now in the special care of the Kris Kringle or Christkindl, who will perform acts of kindness for the person and perhaps offer a special gift at Christmas. On Christmas Eve each tries to guess who played Kris Kringle for them. Keep an Advent Calendar to count down the days until Christmas. A door or window is opened every day of Advent to reveal some aspect of the season in an image or text. Such a calendar can be purchased at a religious bookstore, or another option would be simply to mark each day on an ordinary calendar. Make a Jesse Tree to trace the family tree of Jesus. This is done by making ornaments to symbolize the ancestors of Jesus, beginning with Jesse, the father of King David. The tree can be made of an actual limb, felt or burlap, or construction paper. Many can participate in such a project. Putting Straw in the Manger is another Advent practice in which the family and other groups can participate. Each time a good deed or a work of mercy is performed a piece of straw is placed in the manger. Opportunities abound for doing good deeds or works of mercy for the needy at home, at school, at work, in the neighborhood, in the parish. The straw symbolizing our charity will provide a warm and comfortable crib for the Baby Jesus on Christmas morning. Information and materials for Advent practices are generally obtainable at religious bookstores. Designed to help teens and their parents. But I think everyone could learn something. 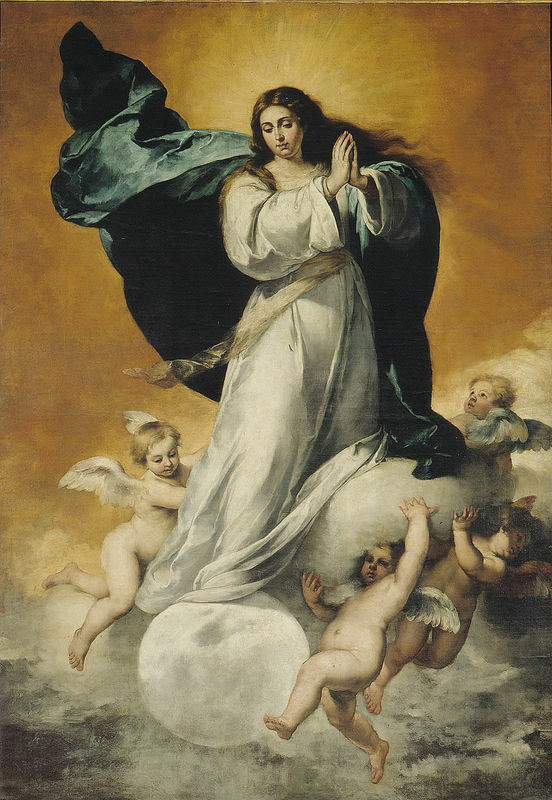 Filled with the most lively confidence in your all-powerful and never-failing intercession. may tend to His greater glory. Amen. 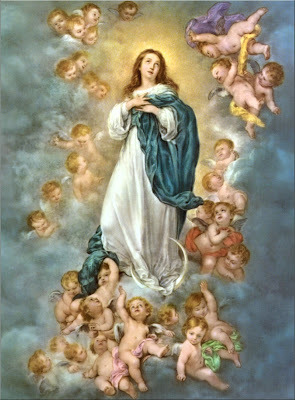 (Our Father, Hail Mary, Glory Be). The following is from the EWTN Advent Calender. 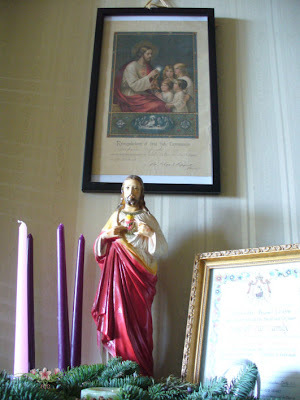 My family is using those daily reflections with our own Advent Calender (see picture above). Christ is the ultimate center of meaning in the universe. It is through Christ that all people will be led to the Father. How can we hope to achieve a world in which all will seek the path of God? Only when men and women are working to achieve the unity that Christ’s redemption promises us. Perform an act of kindness for someone you do not know. Lord, help me be at home with You, that I may listen to Your word and walk in Your way. 1. Fasting: Either severely by bread and water on one day or by skipping a meal at least once a week. We will be less focused on our tummy and be alert for the coming of Christ as a newborn babe. We can also focus our attention on making more mortifications during this time. 2. Silence: By keeping a close guard over the words that come out of our mouths, we will use our ears more to listen for the stillness of the night when Jesus is born. 3. Spiritual Reading This Advent Season, let the Holy Spirit guide us to that little stable in Bethlehem by reading the Book of Isaiah or any other appropriate book. 4. Gift-giving Pray and think about truly meaningful gifts you can give your loved ones, friends or those less fortunate. Let us try not to get caught up in the mad rush to buy something, especially something costly, just for the sake of appearances. If we do, there is a very good chance we will end up with an empty feeling and full of debt. We need to remember that it is not our birthday but Jesus' birthday. What can we give Him to show Him how much we truly love Him? 5. Keeping Watch at Home During the commercial Christmas season, there are many parties, get-togethers, concerts, etc., that will pretty much take up a lot of our time and energy. It will be very difficult to wait patiently for the birth of our Lord if we are so distracted. Let us try to maybe attend one or two social events and no more than that. Let us instead spend more peaceful time at home with our families. What are some ways you and your family will be making this Advent time special? Please share.